The Dr. Clark Quick Kidney Cleanse consists of a group of herbs and nutraceuticals that work in a synergistic manner for optimal cleansing. All products in this cleanse are made in accordance with both cGMP and Dr. Hulda Clark’s protocols. In this toxic world, it is easy for your kidneys to become overwhelmed and weakened due to exposure to common pollutants and invasive microorganisms. The Dr. Clark Quick Kidney Cleanse helps lighten the load on your kidneys through a synergistic blend of herbs, vitamins and minerals traditionally used to cleanse and nurture the kidneys. 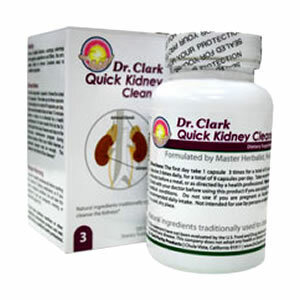 The Dr. Clark Quick Kidney Cleanse helps to support your body’s ability to maintain proper functioning of your kidneys. Helps to support proper functioning of the kidneys. These carefully selected herbs provide a natural cleansing action. By combining several different complementary herbs we greatly enhance each ingredient's effectiveness. This ensures that you receive all the health benefits you expect and deserve. This cleanse also contains Vitamin B6 and Magnesium Oxide to help you maintain healthy kidneys, and Freeze Dried Parsley to help flush out toxins by increasing urine flow. Always take on empty stomach at least 13 minutes before a meal or as directed by a health care professional. The first day take 1 capsule 3 times. From then on take 3 caps 3 times daily. For best results stay on the ParaZap Maintenance and Digestive Aid Program throughout the Kidney Cleanse. After your initial cleanse, a seasonal cleanse is recommended. 1. Stay on the ParaZap Cleanse Weekly Maintenance Program for a minimum of 4 weeks to a year. The benefits are cumulative as the Maintenance Program continues to minimize the effect microorganisms have due to continuous re-exposure. Dr. Clark believed that in order to gain 100% of the benefit of the cleanse, it was best to stay on the Maintenance dose indefinitely. This helps free up your body’s energy for issues that need attention rather than relentlessly fighting microorganisms. 2. The Dr. Clark Digestive Aid works synergistically with the ParaZapCleanse. For even better results take those two programs over the same time period. You will gain on two fronts at the same time; while the ParaZap Cleanse will balance foreign organisms systemically throughout your body the Digestive Aid will optimize your digestion in both your stomach and intestines. 3. The Liver and Gallbladder Cleanse further helps digestion by enhancing the liver’s bile production that in turn helps you digest fat. For best results take the Dr. Clark Quick Liver Cleanse daily. 4. Finally don’t let your kidneys go it alone! Remember that your healthy kidneys can benefit from the Dr. Clark Kidney Cleanse and regular daily dosing of Dr. Clark Quick Kidney Cleanse. No flow agents and minimally processed whole herbs. Chemically pure nutrients. Consult a health professional before starting this cleanse if taking medication, or if you have a medical condition. Do not take this product if you are pregnant, nursing, or below the age 18. If you have adverse reactions or other symptoms discontinue taking product and seek advice for a qualified health professional.